Oxford University Press’s Very Short Introductions series will be familiar to anyone who is old-fashioned enough to still visit serious bookshops. Small enough to fit into an average pocket at 18 by 10 cms, and around 160 pages, and attractively printed and produced, they have proved very popular. It helps, of course, that they are relatively cheap, all the more so when many bookshops, perhaps confusing small size with limited scope, offer them at ‘3 for 2’. There are about 300 titles in the series, at the time of writing (end 2011). All are introductions to some non-fiction topic, from statistics to Jung, from post-structuralism to cosmology, from anaesthesia to film music, from colonial Latin-American literature to environmental economics, and from the periodic table to privacy. OUP advertise them as “ideal for train journeys, holidays, and as quick catch-up for busy people who want something intellectually stimulating”. 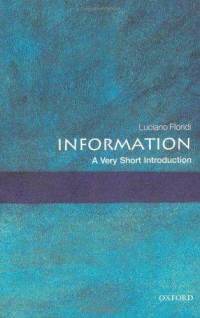 However, I first encountered them when recommending Luciano Floridi’s “Information: a very short introduction”, then moved to recommending the titles on computing and on statistics, and was then impressed by the quality and convenience of the whole series. 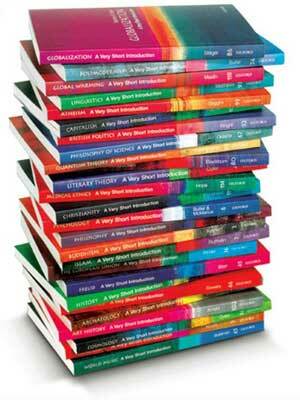 I suspect that in addition to OUP’s intended intellectual market, they will do very well as de facto student texts. Indeed OUP suggest as much in adding, as a coda to their description of the series, that the books may be useful to undergraduates and their lecturers. Yet on reflection, their success – with over three millions books of the series sold – is perhaps a little surprising, as they seem very out of tune with modern trends. Serious in their topics, they seem rather out of place alongside the garish novels and celebrity magazines which are the alternatives for a conveniently packaged read. Invariably written by well-known and authoritative authors, they could be intended as a rebuttal to the idea of the death of expertise. And without colour, still less any iota of multimedia, they seem like a survivor from a previous age in a web-based world. How can they compete with the Kindle and the iPad? Is this I wonder, just an example of the last flowering of the book format, soon to be overtaken by newer technologies? It would, I suppose, be very nice to have the whole series on an e-reader. But maybe that would miss one point behind the success of this series; that it is nice to have in one’s hand a nicely produced physical book, which encapsulates a basic understanding of some topic. And that its physicality, and certainly its small size, encourages us to believe that we too can understand it, with a modest effort. Certainly a nicer feeling than that we get from the prospect of e-reader holding more books than we can read in a lifetime, or of an interminable list of search engine hits. Some may lament that these may be read instead a full-length “proper book”, particularly by students; well, even students have to start somewhere, and these texts are a different order of magnitude of quality than Wikipedia, which seems to be the default alternative. An idiosyncratic hold-over from the great days of print, or a sign that not everything is going to be digital? Who knows? Perhaps in twenty years time we may have a Very Short Introduction to the Survival of the Little Book. DB, a quick check on Amazon reveals that many of the Very Short Introductions are available for Kindle. Curiously, however, Floridi’s book is not one of them. Your point still stands though, I think. Yes indeed, my point, albeit not well expressed, was to wonder how well the printed books will do in the long term against their e-book equivalents. Or indeed against the pirate versions available on the web; a kind of compliment I suppose. I wonder if there is special word for the phenomenon by which works on information matters don’t get to take advantage of new dissemination methods; I recall that, in its early days, the journal ‘Electronic Library’ was only available in print format.